I know fall isn't technically over yet but with Thanksgiving this week we soon turn our thoughts to Christmas and all that winter fun. 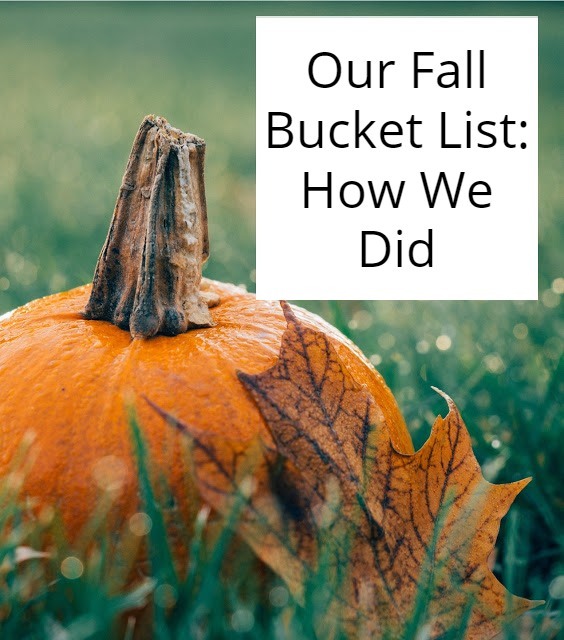 I figured this was the perfect time to look back at our fall bucket list and see how we did! 1. Make pumpkin or apple cider donuts using our new donut pans. I'm dying to try this recipe!-- Check!! We made some absolutely delicious pumpkin donuts. 2. Go apple picking!-- Check!! - We actually went a few times! 3. Make our apple pies and a couple other apple recipes-- Check and Check! - We made Jolly Rancher candy apples, apple pies, and apple butter; just to name a few! 4. Tour the cider mill in Mystic-- Check! We went one weekend to watch their cider making demonstrations. 5. Go hiking a few times to notice all the changing fall colors and try out a few new hiking trails-- Check! I even wrote this post with all our photos from a woodland walk in fall. 6. Get that bike rack mounted on the car and try out a few bike trails-- sadly Alec's bike broke and we still have not gotten around to repairing it so this was not an option. 7. Decorate the house for fall--Check! I was actually quite proud of how much I decorated this year! I decorated a bit inside and out; even making my own double sided porch sign! 9. Visit Pumpkintown-- The boys took one look at the photos online and told me they thought it was meant for much younger kids. We decided to meet up with some friends at the zoo for their Zoo Boo days instead.--- So I'd still land this in the Check column as our goal was to get out for some old fashioned fall fun. 10. Make Twix Cheesecake cupcakes--Check!- Evan actually ended up requesting these for his birthday party and I was so glad to have an excuse to make them! 11. Try out at least two new fall art projects like leaf print painting-- We made watercolor leaf resist paintings and leaf prints too. 12. Make either this harvest caramel corn recipe or a fall Chex mix blend-- Check! and Check!-- We loved this caramel corn recipe that reminded us of our favorite winter treat- Christmas Crack! I made up our own apple butter & maple Chex mix that was just amazing! 13. Go to Mystic Village-- Check! We spent a delightful afternoon wandering this area of cute shops and enjoying some really yummy pizza for lunch. You can read all about our day here. 14. Make a fall wreath-- Check!- I made this beautiful new wreath; If I do say so myself! 15. Go letter boxing. Check! We found one trail that had 9 letterboxes hidden alongside and it managed to find 8 of them. We're definitely going to try more letterboxing whenever the weather allows. 16. Check out an old cemetery and try to make a few rubbings of old gravestones.-- After reading more about gravestone rubbings we discovered that it is illegal in many states (and while I could not quite figure out if it was indeed illegal in our state it didn't seem the worth the risk to try!). 17. Make yarn pumpkins using balloons-- Check! Alec and I tried this craft one afternoon and Alec just LOVED how his pumpkin turned out. I could not believe how messy it was. 18. Bring watercolors outside and paint the fall foliage we see-- Check! Alec actually wanted to bring our acrylic paints outside and paint some fall foliage. We weren't able to finish our paintings in one day since acrylic paints take a bit longer to dry but we did have fun (even if it was pretty cold outside!). 19. Make some homemade pretzels-- Check!-- Boy were they tasty! 20. Make an exploding pumpkin with baking soda and vinegar and paint--Check!-- We decided to make Oozing pumpkins instead using elephant toothpaste and liquid watercolors. 18 out of 20! I'm pretty proud of that. Did you have a fall bucket list? How did you do? What a fun post! I am definitely going to make a list for next fall so that I don’t miss out on doing anything. It’s been years since I’ve been to Mystic, CT, but I didn’t get a chance to tour the Cidermill. I really want to tour a Cidermill, but I have yet to do so. Also, I didn’t know about letterboxing, and found that interesting as well. Today, as it turns out, I am making pumpkin donuts! I have a doughnut pan, and made them years ago, but today I’m trying a new recipe that employs the use of cake mix. It probably won’t be as good, but I’m very curious. You'll have to let me know how they turn out! We have yet to use our donut pan again but I'm thinking it would be fun to make up something Christmasy with it. You always inspire me on how much you get to do. Looks like you did some great baking. Those donuts look amazing :) Thanks so much for sharing your post with us at Welcome To The Weekend Blog Hop. Have a great weekend and we hope to see you soon. Aw, thank you! That's so sweet.